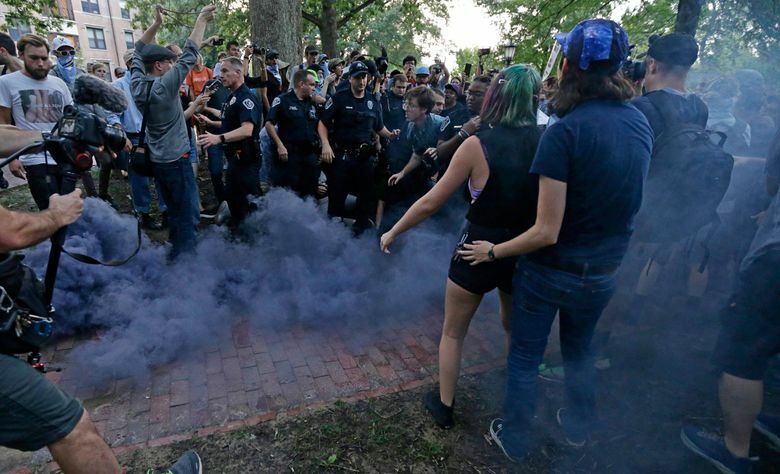 CHAPEL HILL, N.C. (AP) — Protesters at North Carolina’s flagship university took advantage of a non-confrontational police response to topple a century-old Confederate statue that’s long been the target of critics who say it symbolizes racism. 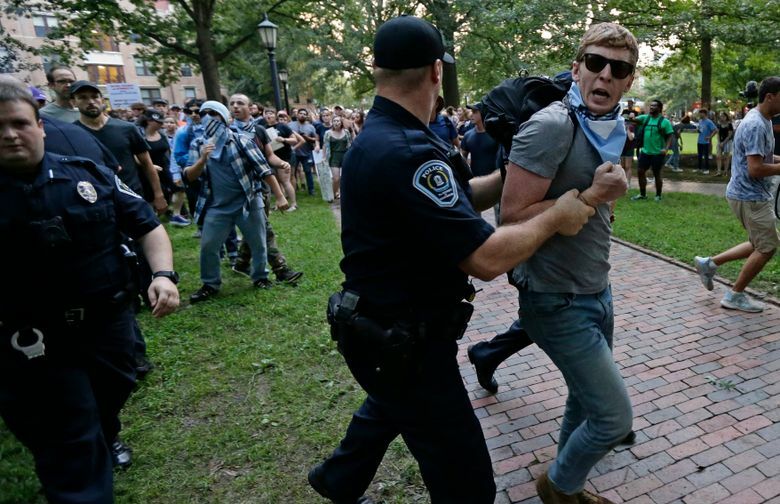 A year before protesters took down “Silent Sam,” University of North Carolina campus police responded much differently to a similar protest. 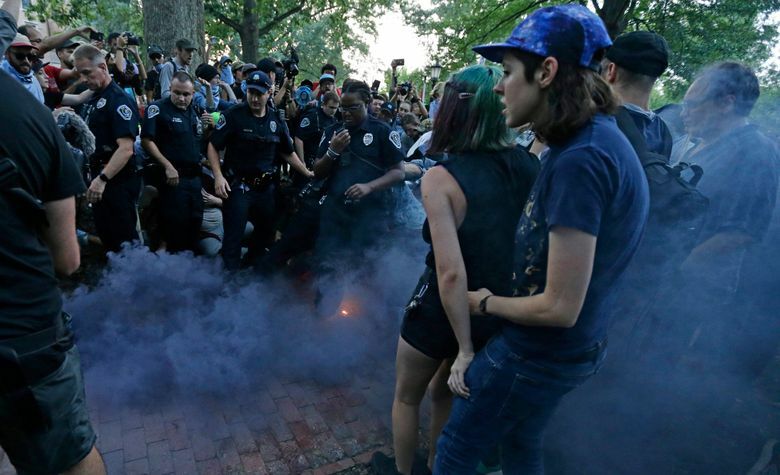 In 2017, officers in riot gear faced criticism for heavy-handed tactics after using metal barricades to keep activists from getting near the statue. 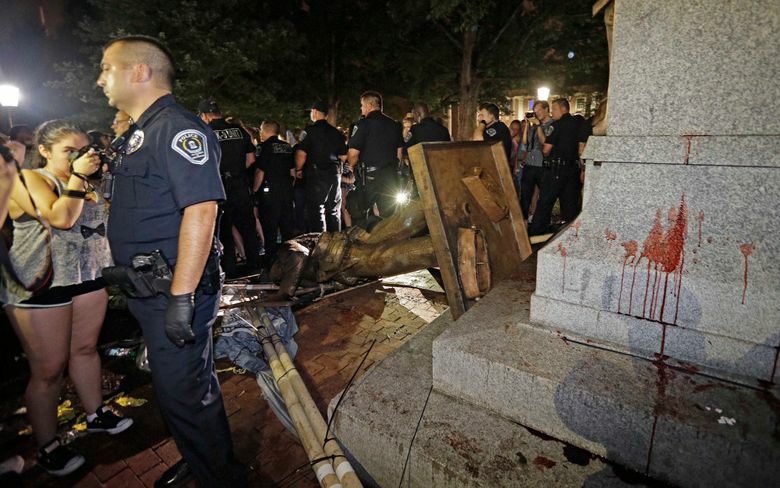 The portable barriers weren’t used Monday, and officers didn’t keep protesters away from the statue. 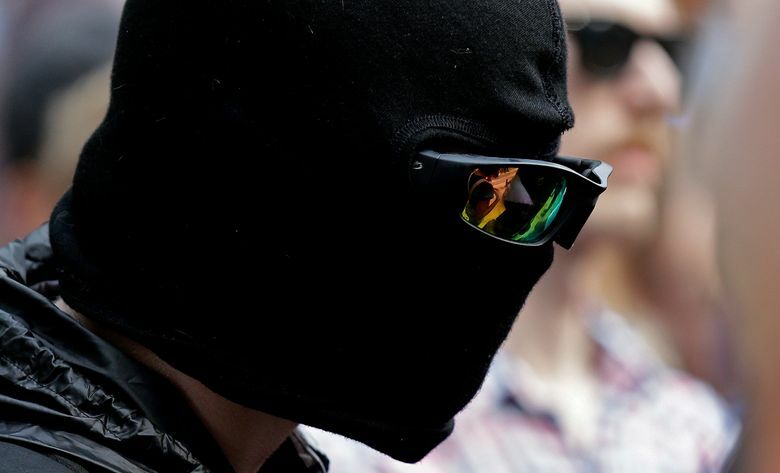 The bronze figure of an anonymous soldier was pulled down from its stone pedestal with ropes by protesters who used banners to mask their action. University and legislative leaders said they’re taking a hard look at how protesters used “mob rule” tactics to bring down the statue. 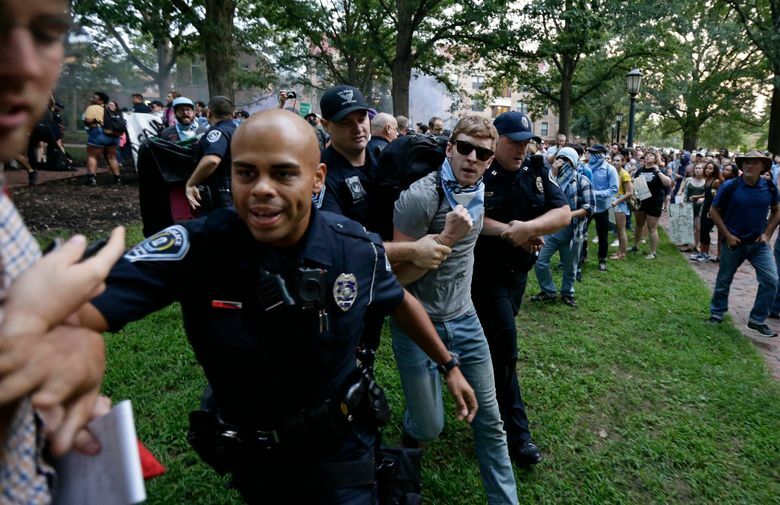 A top legislative leader urged all levels of government to reevaluate the response to such protests, while campus police were preparing a detailed timeline of events leading to when “Silent Sam” fell. 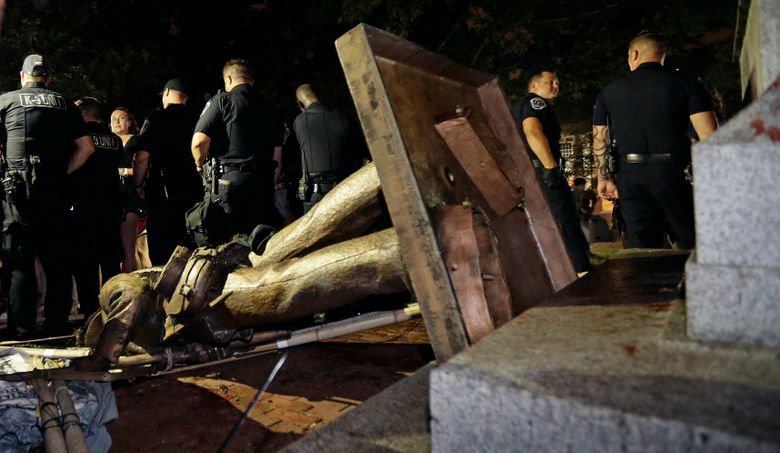 Chancellor Carol Folt and UNC System President Margaret Spellings, along with the heads of their boards, issued a joint statement acknowledging “many have questioned how police officers responded” but it wasn’t the administration’s intention to allow the statue to fall. 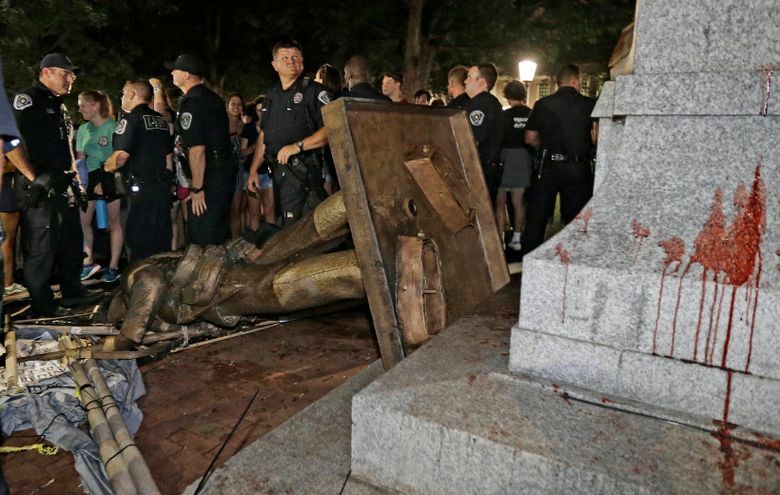 The statue, erected by the United Daughters of the Confederacy in 1913, had been under constant, costly police surveillance after being vandalized in recent months. 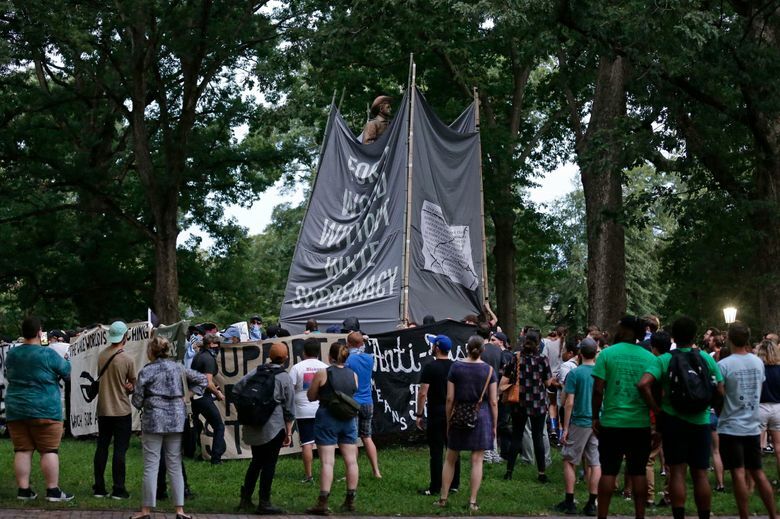 Many students, faculty and alumni argued that “Silent Sam” symbolized racism and asked officials to take it down. The backlash comes on the eve of the state historical commission’s meeting to discuss Gov. Roy Cooper’s request to remove three other Confederate monuments at the state Capitol. 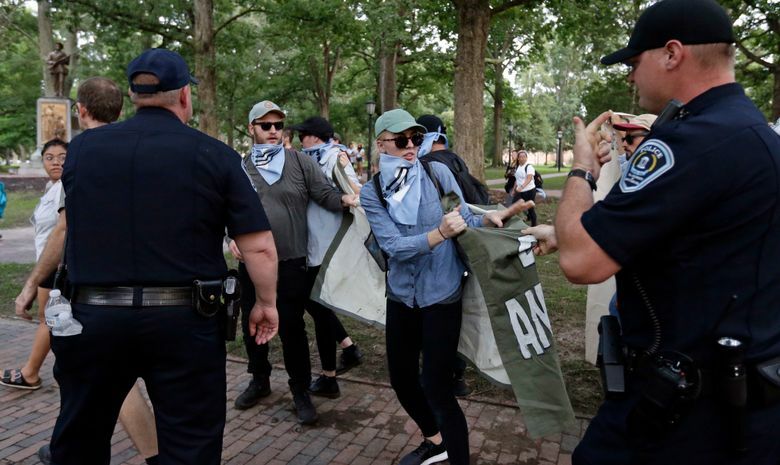 Two state lawmakers — moderates from each political party — said they’re worried the protesters’ actions Monday could prevent finding peaceable solution to Confederate memorials statewide. Democratic Rep. Ken Goodman of Richmond County said he doesn’t approve of the way the statue was destroyed, but understands frustration over Confederate monuments. “It needs to be resolved and I don’t think leaving the statue there resolved the issue … but you can’t erase history, so maybe there’s some third way to deal with that issue,” he said. On Tuesday, students stopped by the empty pedestal to take photos or simply observe the protest’s aftermath. Associated Press writers Alex Derosier, Gary D. Robertson and Emery P. Dalesio contributed to this report.